Threaded Inserts are made from Free Machining, Free Cutting, Leaded Brass, 300 Series Stainless Steel or Aluminium which are Passivated and Tested to ASTM Standard. 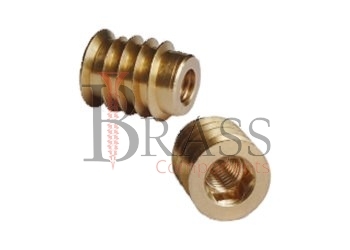 Threaded Inserts are available in any metric or imperial sizes as per custom specification. Threaded Inserts provide high tensile strength, excellent resistance to corrosion and good electrical conductivity. Threaded Inserts are available in Unheaded, headed and reverse headed types. Unique knurl and groove design gives excellent resistance to torsion and pull-out. The head can be used to make an electrical contact, retain a component or to increase torque resistance. The range of Threaded Inserts are also Available in regular and short versions with reduced head diameter and double head height sizes. Threaded Inserts are suitable for ultrasonic, heated or cold press-in installation into most grades of plastic. The tapered design of Threaded Inserts reduce Installation time, making alignment faster and more accurate. The range of Threaded Inserts provide an extremely strong and reliable way to join or fasten for easy assembly. Provide high resistance to Tensile Pull and Torque Loads. Threaded inserts meet RoHS Requirement and UL Listed. For Cold Set installation into plastics. Threaded Inserts for light loading applications in wood and composites. For ultrasonic and thermal installation into thermoplastic or structural foam. Ideal for Thin-Wall applications and Mold-In applications. We manufacture Threaded Inserts as per Custom Specification and export in Germany, Spain, Netherlands, Portugal, UK and other European Countries. For more Information, Please Contact Us or Inquiry Now.